Yesterday I received my fabrics and clues for month 1! I was so excited I had to piece everything together right away! 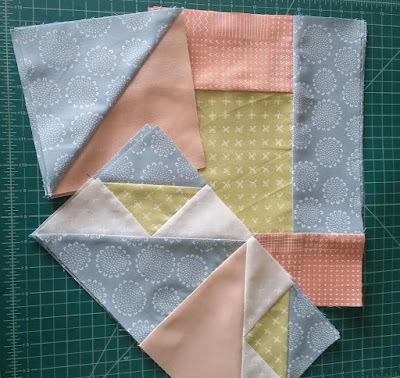 lol I choose the Summer in the Keys color way for the large quilt which are fabrics from Blueberry Park and Kona Cottons. Like I mentioned in my last post is they PRE CUT the fabric pieces and they even trimmed off those pestie dog ears for you already too, yayy lol Everything went together easy and fast! So if you have very little time to quilt you'll only need like 30mins - 1hr at most to piece this months together. 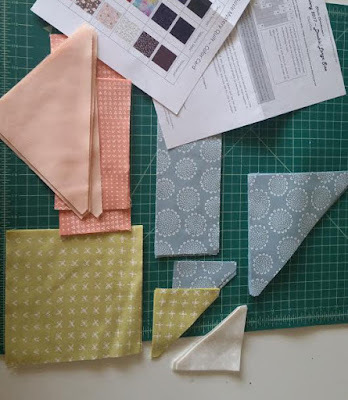 Here are some photos of the pre-cut fabric and also my finishing pieces. I hope you all will join, and if you do share with me your progress!